The situation on Manus Island is rapidly deteriorating. The centre may now be closed, but over 600 men still reside at the centre, afraid to move to transit centres in the local community for fear of attacks. Power and water have been cut off from the centre, and food and medical supplies are no longer being delivered. Call Minister Dutton and your local MP and ask them to end this crisis by bringing the men on Manus Island to Australia. Send a solidarity message to refugees on Manus. Write a letter. 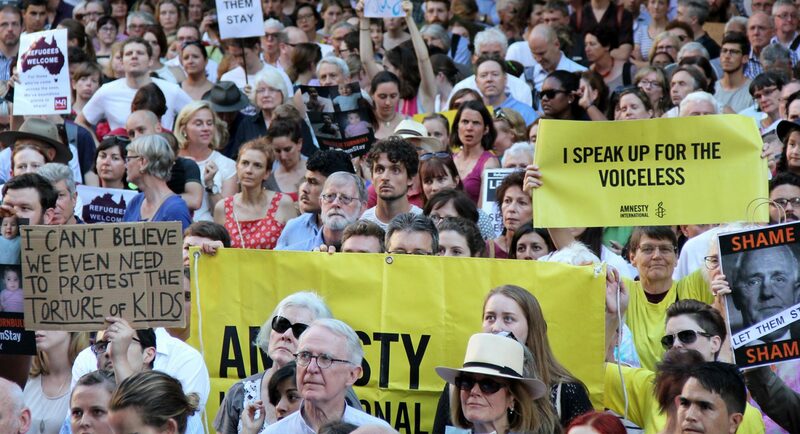 Amnesty International has released a global Urgent Action calling on the the Australian and PNG governments to create safe options for refugees and people seeking asylum on Manus. View the Urgent Action and get postal information here. Host a vigil out the front of your Federal MPs and Senators electorate office. Use the these candle labels which represent each death of a refugee that the Australian Government is responsible for on Manus Island and Nauru. Sign and share the petition on social media. Join us the at the refugee hook up on Tuesday 14th of November 8pm AEST to hear first hand from the research team experiences and findings. Join online here. Put your support behind a better plan to make sure that this cruelty ends and never happens again. We know that watching this crisis unfold is tough. Many Australians care deeply about the plight of refugees, and the situation on Manus Island is taking its toll. The best way to make sure that you can create positive change is to look after yourself. Check out this self-care guide for some tips on identifying when you might be feeling burnt out and what to do about it.